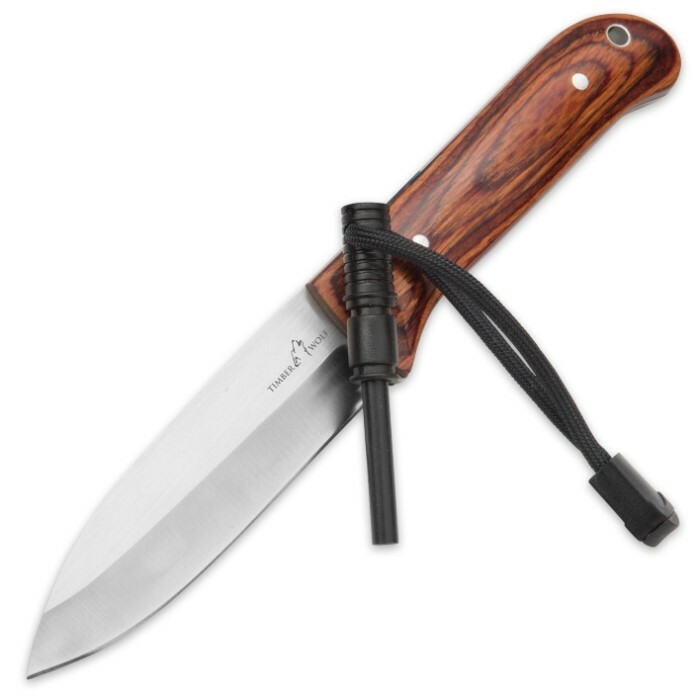 Timber Wolf WildSteel Fixed Blade Knife with Genuine Leather Sheath and Fire Starter | BUDK.com - Knives & Swords At The Lowest Prices! Timber Wolf's WildSteel Fixed Blade Knife may seem small at first glance, but use it once or twice and it's clear - this comfortably sized knife is hugely versatile. In fact, the only thing "small" about it will be your chore list after the WildSteel is finished tackling it! The 4" stainless steel drop point blade's carefully honed, razor sharp edge slices cleanly through leather and other tough materials. 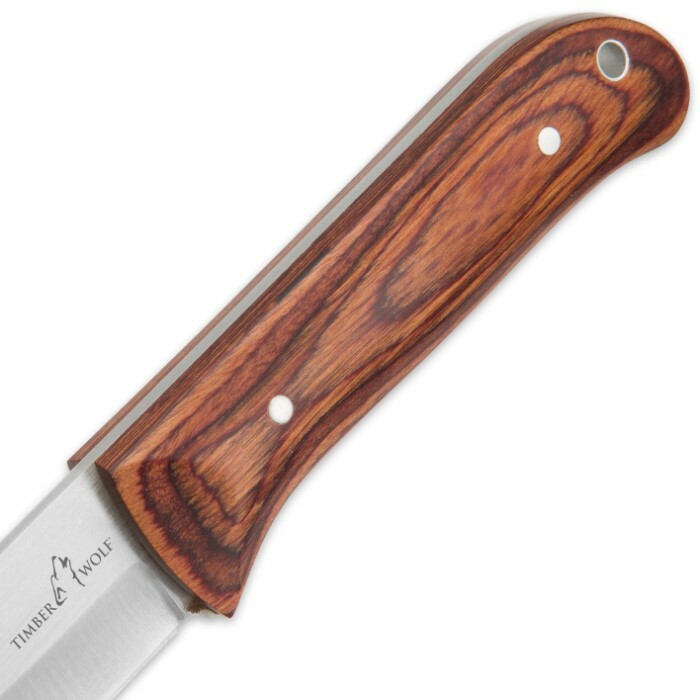 Add the incredible hand-feel of the pakkawood handle scales and the WildSteel's impeccable overall weight distribution, and you've got a knife perfectly suited to skinning, caping, woodcarving and other jobs that require both aggressive cutting efficiency and delicate control. At 8 1/2" overall, the WildSteel is remarkably easy to transport in the field, especially with the included genuine leather belt sheath and the handle's integrated lanyard hole. 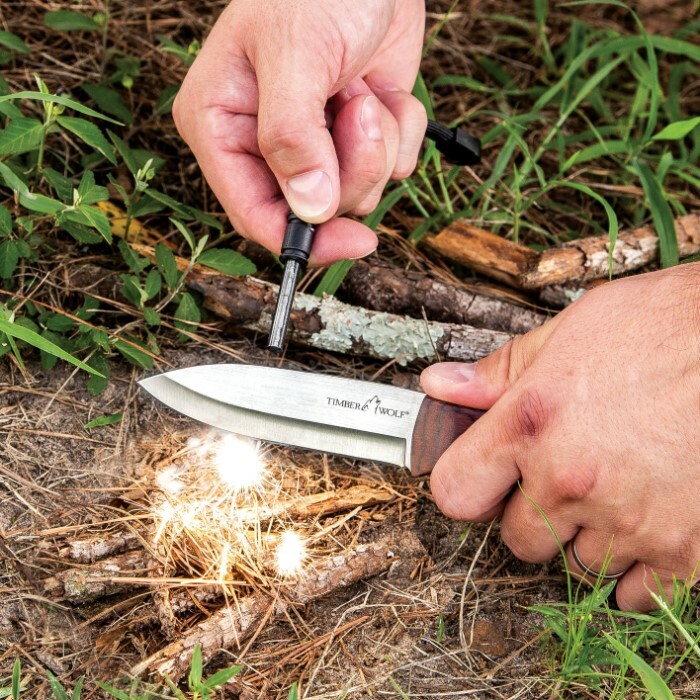 A handy fire starter is tucked away in a small pouch on the front of the sheath - yet another addition to the WildSteel's long list of outdoorsman-friendly qualities. Yet it's these same traits - comfortable size, effortless cutting, incredible feel - that make the WildSteel equally great for jobs around the home or farm. And at this price, why not get two - one for your outdoor gear and one for your toolbox? Better still, add a third for family and friends! The WildSteel makes a fantastic gift - one the recipient will actually use, no less! 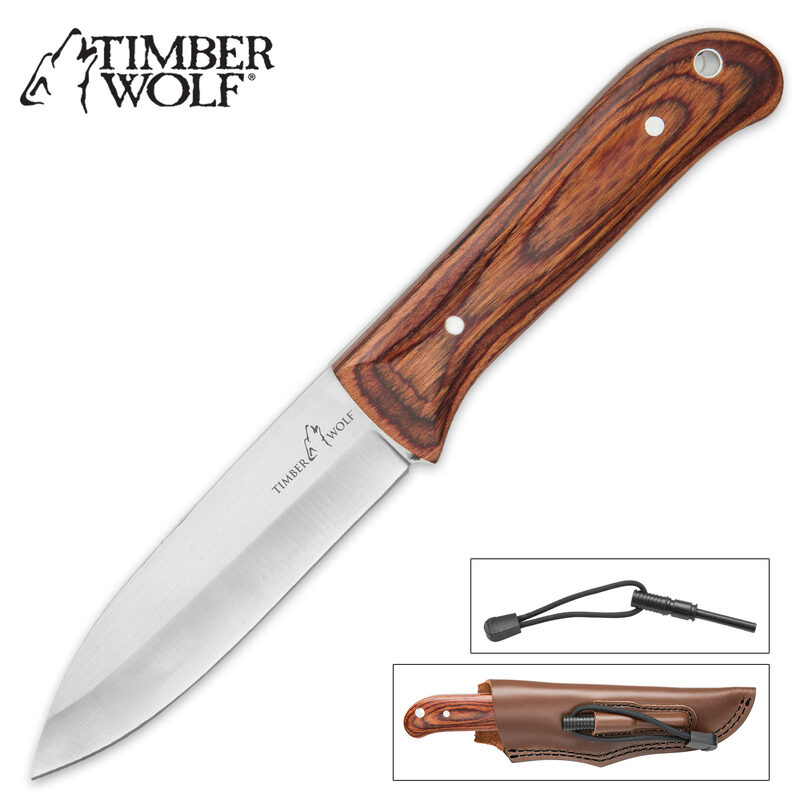 Timber Wolf's WildSteel Fixed Blade has everything you want in a great utility knife plus a convenient fire starter - all at an outstanding value to boot. So stop wrestling with inferior knives and trade up to the WildSteel today!